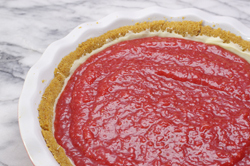 Double down on strawberry season with this charming pie. 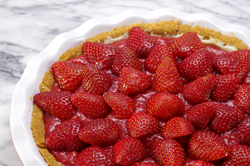 Fresh strawberries form both the topping and the filling for this pie. 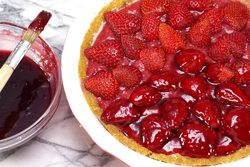 Unlike most fruit pies where the fruit cooks and changes character during baking, this chilled pie celebrates strawberries in primarily fresh form. 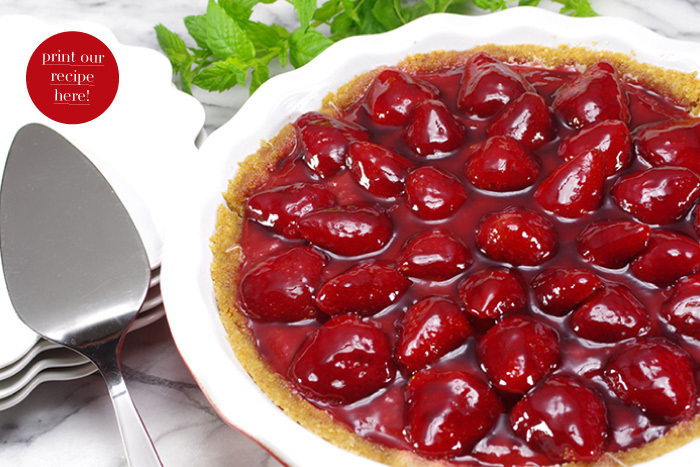 All the goodness of these red gems is held in a cookie-based crust that assembles easily and perfectly complements the strawberries’ starring role. It’s a pie best eaten within a day or two – but accomplishing that is usually not a problem! 1. 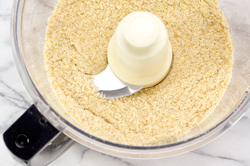 In a food processor, crumble the vanilla wafers into a fine crumb. 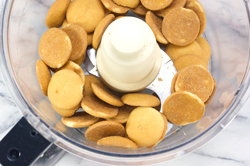 (Or, place the vanilla wafers in a plastic bag and crumble with a rolling pin). 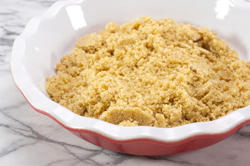 Add the sugar to the crumbs, combine until evenly distributed. Add the melted butter and again combine. 2. 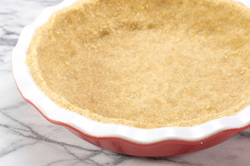 Place the buttered crumbs into a 9-inch pie plate and pat into place on the bottom and up the sides of the plate. Bake in a 350°F oven for 10-12 minutes. Remove from the oven and let the pie crust cool completely. Once cooled, brush the inside of the crust with a thin layer of melted white chocolate (this will help to keep the crust from becoming soggy and will be barely noticeable). 3. Prepare the strawberries by washing and hulling. Halve the strawberries, set aside a third of the strawberries. 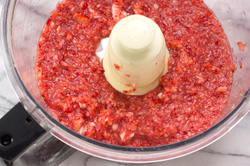 With the remaining strawberries, crush with a masher (or puree in a food processor) and place in a small saucepan. Add the sugar, vanilla, and lemon juice and warm over low heat. 4. 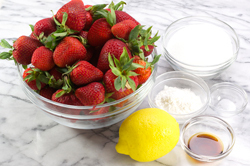 Dissolve the cornstarch in the cold water and gradually stream into the strawberry mixture stirring constantly. Increase the heat and with continuous stirring, allow the mixture to reach the simmering stage and begins to thicken. Continue cooking and stirring until thickened. Remove from heat and allow to cool to room temperature. 6. 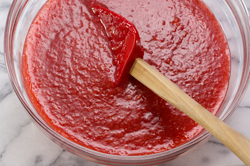 An hour or two before serving, add the final glaze by warming the seedless jam until liquid. 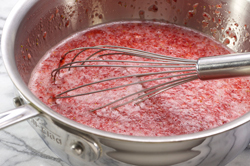 Add a tablespoon of water to thin the jam a bit more. Dab the jam on top of the fresh cold strawberries; use a light hand. Chill again immediately. 6. Shortly before serving, prepare the whipped cream topping. 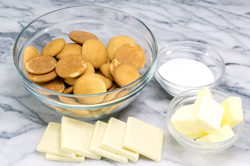 In a chilled, deep mixing bowl, combine the cold cream, vanilla, and powdered sugar. Stir until the sugar dissolves. Whisk vigorously by hand, or using the whisk attachment beat in a stand mixer just until stiff peaks form. Do not overbeat. 7. Serve wedges of the pie. 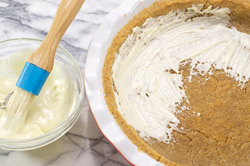 Top with generous dollops of whipped cream.